Digestion is a complex process with many moving parts and there are many steps along the way for something to go wrong. One of the more increasingly common disorders is a condition known as “leaky gut.” Leaky gut, otherwise known as intestinal hyperpermeability, is when perforations develop and allow undigested food and toxins to pass back into the body. Sound like a problem? It is. Leaky gut can be the starting point for anything from food intolerances to inflammatory bowel disease. 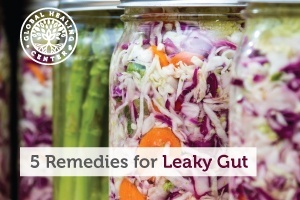 If leaky gut is a problem for you, you have options, and here are five to get you started. Increasing the amount of omega-3 fatty acids in your diet is another way to combat inflammation. Some research even suggests omega-3s could work to alleviate symptoms of inflammatory bowel disease. There are a couple ways to get more of this nutrient; you could consider a supplement, or simply eat more fatty fish, like salmon. If you’re a vegan or concerned about some of the aspects of eating fish, that, of course, limits your options. Is leaky gut currently a problem for you? Have you tried any of these five remedies, or do you have another to share? Leave a comment below and share your thoughts. 1. West, N. P. et al. Probiotic supplementation for respiratory and gastrointestinal illness symptoms in healthy physically active individualshttp://www.clinicalnutritionjournal.com/article/S0261-5614(13)00261-6/abstract. Clinical Nutrition. 33 (4). 2. Olendzk, B. C. et al. An anti-inflammatory diet as treatment for inflammatory bowel disease: a case series report http://nutritionj.biomedcentral.com/articles/10.1186/1475-2891-13-5. Nutrition Journal. 13. 3. Rapin, J. R. & Wiernsperger, N. Possible Links between Intestinal Permeability and Food Processing: A Potential Therapeutic Niche for Glutaminehttp://www.ncbi.nlm.nih.gov/pmc/articles/PMC2898551/. Clinics (Sao Paulo). 65 (6). 4. Simopoulos, A. P. Omega-3 Fatty Acids in Inflammation and Autoimmune Diseases http://www.tandfonline.com/doi/abs/10.1080/07315724.2002.10719248#.Vr5NaRorJsM. Journal of the American College of Nutrition. 21 (6).